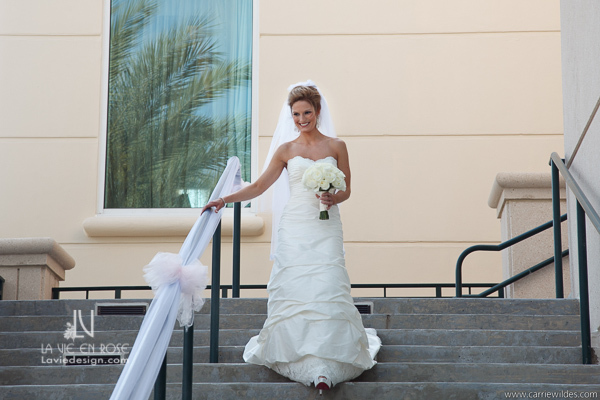 Lauren and Josh took a non-traditional approach when it came to the color scheme of their wedding at Mariott Waterside Hotel in Tampa. 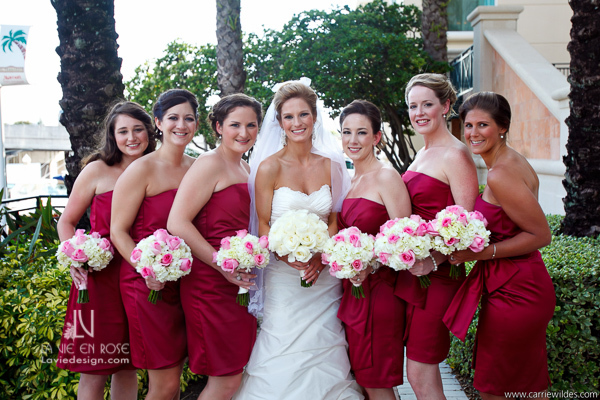 They chose crimson and bright fuchsia as the central theme, and brought the two colors together with cream and ivory. 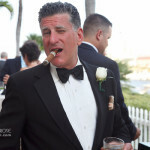 This wedding oozed with passion and life, with a hint of playful fun! You can probably tell by the pictures that Lauren and Josh did not let any detail go unnoticed… all the way down to the groomsman’s matching fuchsia and paisley ties! We are sure you will enjoy this wedding photo collection as much as we do, and don’t forget to take a look at those pretty, pink tulips too! 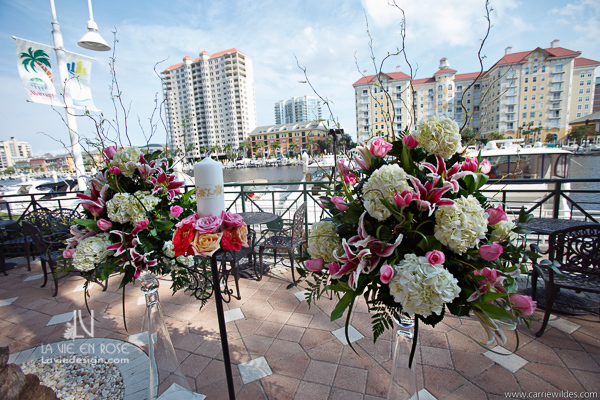 La Vie en Rose provided all florals, centerpieces and votives for this event. Thank you to Carrie Wildes Photography for the great images! 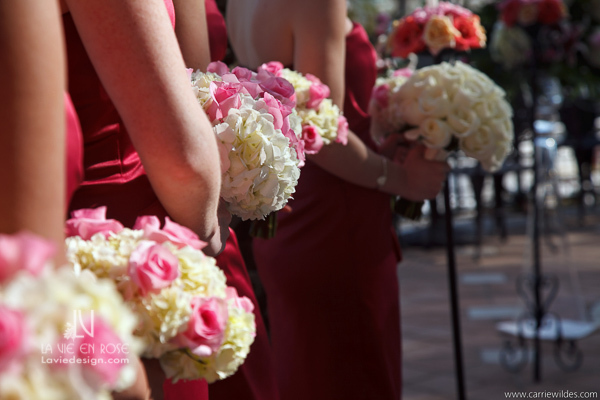 Ivory roses, fuchsia roses, and hydrangea…those dresses are gorgeous behind these bouquets. What a color palette! 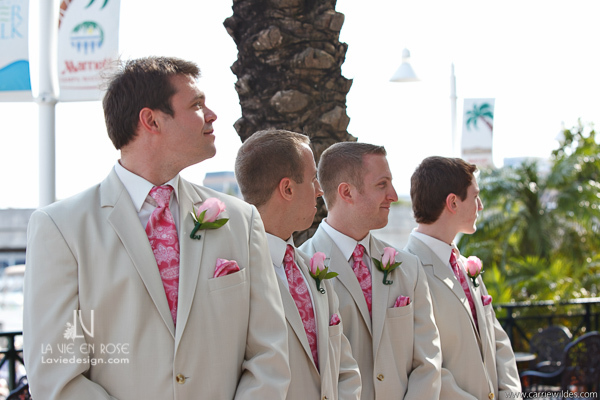 Simple and bright, these single rose boutonnieres payed compliment to the groomsman’s attire. A closeup of the bridesmaid bouquets shows the hydrangea and roses arranged in perfect harmony. The bride’s bouquet is made up of ivory roses, and is wrapped with a traditional ivory wrap. The ceremony stage is set…two tall arrangements await a bride and groom. The candle will be lit soon, and it will be official! 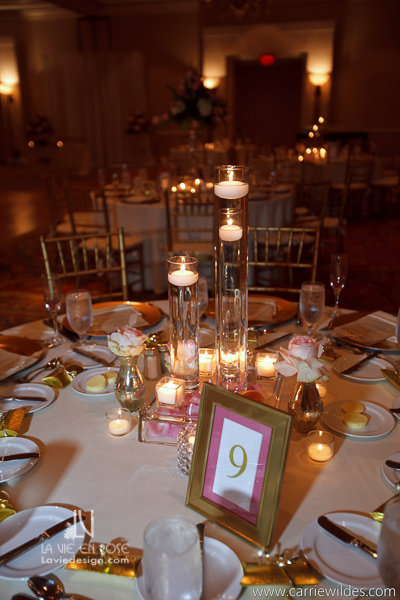 Simple mercury bud vases hold a single rose, while the table is lit up with floating candle cylinders. This centerpiece is simple but makes a big statement. 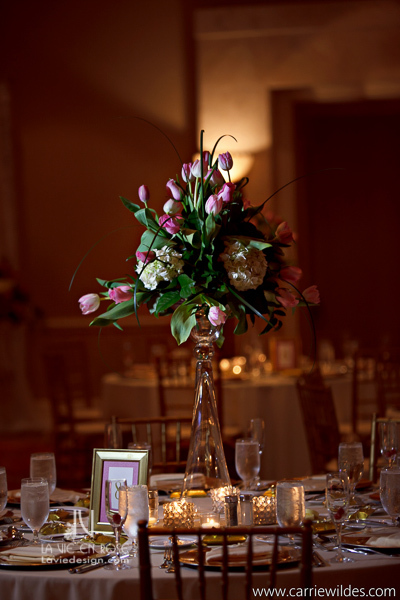 The sweetheart table tulips! They look gorgeous next to the fuchsia roses, and the white stock with bear grass hangs down to make this pretty arrangement look a little wild and fresh! 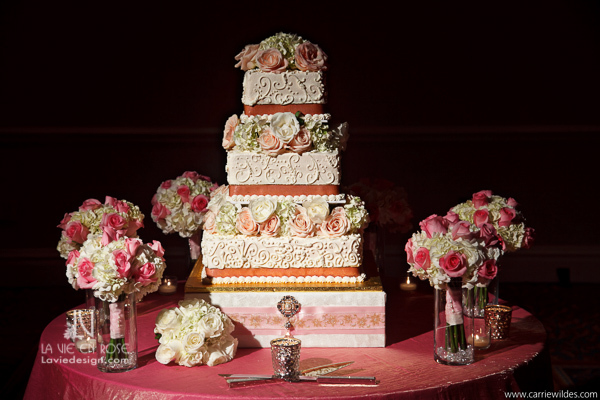 The cake is undoubtedly intricate, and how did we get all those roses and hydrangea in between those layers? Very carefully! 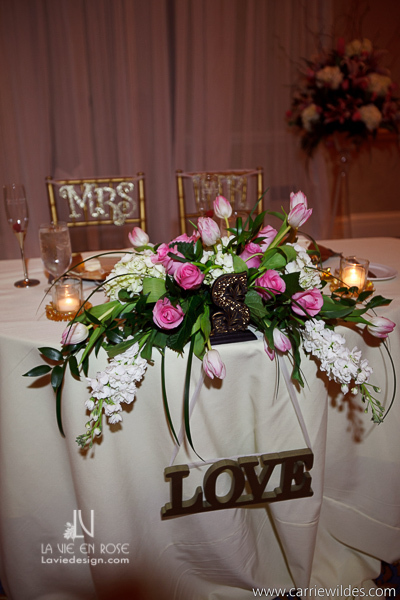 A few of the guest tables were adorned with these larger arrangements that matched the sweet heart table. This made it all one cohesive design, despite the little differences throughout the room.